Que le Comité du transport en commun reçoive le présent rapport à titre d’information. This report describes the transit route changes that will be made later this year, based on the 2007 Transit Service Plan report that was presented to Transit Committee on January 31, 2007, and on the route change proposals that were circulated in February and March, the public consultation that took place in March and April and the discussions that staff held with the Councillors for the wards affected in April and May. Some of the route changes differ from the proposals that were circulated earlier in the year. The revisions are based on the results of the consultation and subsequent discussions with the Councillors for the wards affected. Most of the service changes outlined in this memo will begin in September 2007. Some will begin in later in 2007, as noted individually below. § make final plans based on the results of the consultation. § standards on service hours, levels of service and service capacity, to guide how frequently and over what hours of the week each service element of the transit network is provided. 7. If the Councillor does concur or if the proposal has been approved by Transit Committee and Council, the service changes proceed to implementation. Maps illustrating the route changes described below follow this report. Route 261 provides peak period express service from Stittsville to downtown Ottawa. A suggestion to change the route to serve Fringewood Drive between Harry Douglas Drive and Hazeldean Road was made last year during a previous consultation process and was put forward for consultation this year by the Councillor for the area. Response to the consultation was uniformly positive. Staff support the change because it will result in a net improvement in transit service for the area. Several changes will be made to improve local service in northern Kanata. These changes are possible because of the increased funding that was identified in the 2007 Transit Service Plan report and that was approved by Council in the 2007 budget. The changes will improve access to the Kanata North employment area for residents in all parts of Kanata, will improve access to the Transitway system for residents of northern Kanata, will add new service outside peak periods to Penfield Drive, and in conjunction with the route changes in southern Kanata will increase travel options between all points in Kanata and the rest of the transit system. The major crosstown downtown bypass route from Orléans to Kanata will be changed to allow improved connections from local routes in Kanata and to provide improved access to points in the Kanata North employment area. Route 101 will operate as now to Kanata via Highway 417, then via Campeau Drive, Teron Road, March Road, Solandt Road, Innovation Drive, Terry Fox Drive, Legget Drive to the cul-de-sac at the east end of Solandt Road, again via Legget Drive and Herzberg Road to March Road. 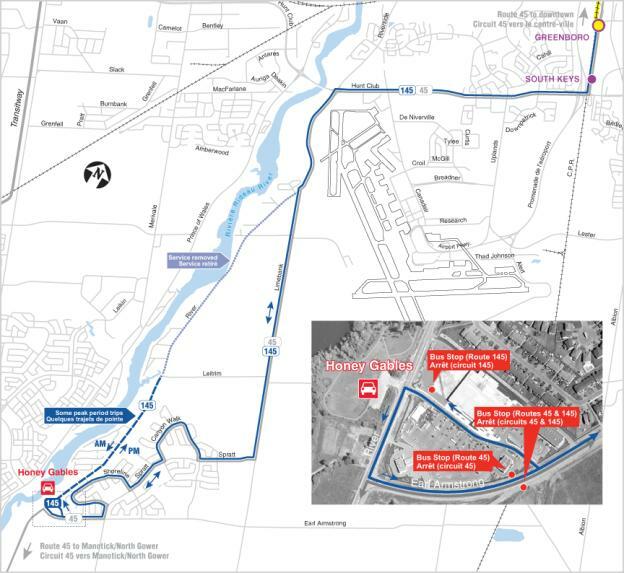 The route will make connections with Kanata local Routes 160, 164 and 169 at the upgraded transfer facilities on Campeau Drive at Teron Road under construction this summer as part of the Eagleson Station improvements. The current trips on Route 182 that provide service to businesses in the Kanata North area at off-peak times and on weekends will be changed to be provided on Route 101. This route change has been modified from the original change proposed earlier in the year based on the results of the consultation process. The change was made to retain service to the businesses on Herzberg Road near March Road and to improve service to the businesses along Legget Drive and Solandt Road. Route 160 will be changed to operate from Terry Fox Station via Kanata Avenue, Katimavik Road, Eagleson Road, Campeau Drive and Teron Road continuing on its current route north of Beaverbrook Road. This change will allow residents and workers a much shorter travel time to connect with Route 96 Transitway service at Eagleson Station and will allow easy north-south connections within Kanata at Eagleson Station and at the upgraded transfer facilities on Campeau Drive at Teron Road being built this summer. The service now provided by Route 160 north of Terry Fox Station and west of Teron Road will be provided by a new Route 168. Route 165 will be changed to provide new service outside peak periods on Penfield Drive. This service will operate between approximately 07:30 and 16:00, Monday to Friday. This change, not originally part of the proposals circulated earlier in the year, was suggested during the consultation process and is supported by staff. The new Route 168 will operate from Terry Fox Station over the current Route 160 via Kanata Avenue, Goldridge Drive, Knudson Drive and Beaverbrook Road, and will continue north on Teron Road and March Road, turning around via Terry Fox Drive, Legget Drive and Solandt Road. On Saturdays and Sundays, Route 168 will turn around at Beaverbrook and Teron and will not extend north into the employment area. The new route replaces part of the current Route 160 and provides an improved service from the Kanata Lakes and Beaverbrook areas to the Kanata North employment area. Route 169 will be changed to operate via Teron Road, March Road, Herzberg Road and Carling Avenue, then to continue north on March Road as now. This change will provide a connection from Routes 101, 160 and 164 at the upgraded transfer facilities on Campeau Drive at Teron Road to employment locations near March Road and Herzberg Road. This change, not originally part of the proposals circulated earlier in the year, has been developed to respond to input received during the consultation process, and gives another service option to the businesses on Herzberg Road near March Road. A small change will be made to Route 65 to add service on Campeau Drive between Teron Road and Knudson Drive. This change will add new travel options for people who live in the new residential area south of Campeau Drive, already served by Route 68. This change is possible at a very low cost because buses already travel along this section of road out-of-service to be positioned for the current starting point of the route at Campeau Drive and Knudson Drive. This change, not originally part of the proposals circulated earlier in the year, was suggested during the consultation process and is supported by staff. Several changes will be made to improve local service in southern Kanata. These changes are possible because of the increased funding that was identified in the 2007 Transit Service Plan report and that was approved by Council in the 2007 budget. The changes will reduce travel time from the Bridlewood area to connections with the Transitway system at Eagleson Station, will improve access to the Kanata North employment area from southern Kanata, will improve local travel options within southern Kanata, will provide convenient two-way transit service along the length of Eagleson Road and will establish a route structure that can be expanded to serve new areas west of Eagleson and north of Hope Side Road as development continues. Route 161 will be changed to follow its current route from Terry Fox Station to Eagleson Road and then to operate via Eagleson Road and Bridgestone Drive, turning around via Stonehaven Drive, Bridlewood Drive, and Steeplechase Drive, then returning west and north over the reverse route. Route 164 will be changed to operate on Stonehaven Drive east of Eagleson Road, turning around via Stonehaven Drive, Grassy Plains Drive and Bridgestone Drive, and returning west and north over the return route. As part of this change and the funding approved subsequent to the 2007 Transit Service Plan, Route 164 will operate all day long, seven days a week. The current peak period trips to and from Hope Side Road will continue to operate. This route change has been modified from the original change proposed earlier in the year based on the results of the consultation process. The change was made to retain service on Grassy Plains Drive. Route 169, which provides peak period service between southern Kanata and Kanata North, Shirley’s Bay, Nortel and Bayshore, will be revised to follow the same route as Route 161 in the Bridlewood area. The current service along Palomino Drive and north on Eagleson Road will continue to operate. The direction of Route 66 will be changed, so that service leaves Kanata in the morning via Bells Corners rather than via Eagleson Station. The change will reduce travel time for commuters from southern Kanata and Bells Corners. In the morning, the revised Route 66 will operate from Eagleson Road via Cadence Gate, Equestrian Drive, Harness Lane, Stonehaven Drive, Stonemeadow Drive, Bridle Park Drive, Bridgestone Drive, Grassy Plains Drive, Stonehaven Drive, Richmond Road, Moodie Drive, and Highway 417 and the Transitway to downtown Ottawa. In the afternoon, buses will follow the reverse route from downtown to Kanata. Along with this major change to Route 66, consequent changes will be made to Route 61 and Route 69. In Kanata, Route 61 will be changed to provide service on Palomino Drive, now part of Route 66. In Bells Corners, Route 69 will no longer provide service on Moodie Drive between Richmond Road and Robertson Road, as a faster trip to downtown will be available from those stops on the revised Route 66. Local service in Barrhaven will be reorganised to provide improved service in the Stonebridge area and to allow expansion into more of the new residential areas of Barrhaven South as they are developed. These changes are possible because of the extension of Route 95 Transitway service to Barrhaven Centre, which began in January 2007. A new Route 171 will be established, combining the service between the Stonebridge area and Marketplace now provided by Route 186 with the eastern part of Route 173 between Marketplace and Fallowfield Station via Stoneway Drive. Most customers travelling from Stonebridge to central parts of Ottawa will transfer to Route 95 at Marketplace. Staff are currently examining the feasibility of providing new Sunday service to Stonebridge within the 2007 budget levels. If this new service were possible, Route 171 would run between Fallowfield Station and Stonebridge seven days a week, but if not, service on Sundays would run only between Fallowfield Station and Marketplace. Route 173 will continue to operate over its western section, between Fallowfield Station and Marketplace via Jockvale Road and Tartan Drive. Route 186 will continue to operate during peak periods, providing service between Manotick and Fallowfield Station via Jockvale Road and Greenbank Road. Route 70 will be extended to provide new service in a new residential area west of Cedarview Road. In the morning, trips will begin at Maravista Drive and run south on Cobble Hill Drive and east on Kennevale Drive, to rejoin the current route. The section of Cedarview Road between Maravista and Kennevale will continue to be served by Route 76. This change will begin when roads permit, currently expected to be in late 2007. Further extensions within the new residential area will be possible as road construction continues. Route 77 will be revised to provide new service in a new residential area west of Woodroffe Avenue and south of Strandherd Drive. Buses will operate via Chapman Mills Drive and Beatrice Drive. This change will begin when the traffic signals are installed at Strandherd Drive and Beatrice Drive, currently expected to be in late 2007. Route 145 will be revised so that it provides two-way service through Riverside South, to reduce travel times from central parts of Ottawa to Riverside South, and to allow local travel between destinations within Riverside South. Most trips will turn around at the commercial area at the intersection of Earl Armstrong Road and River Road. Some trips during peak periods will be extended to serve the section of River Road between Leitrim Road and Earl Armstrong Road, to continue to serve the new residential area west of River Road. With this change, service will be removed from the section of River Road between Limebank Road and Leitrim Road. This part of the City is outside the Urban Transit Area, does not contribute through its taxes to the cost of operating Route 145 and has been receiving service only temporarily while road connections to and within Riverside South have been improved. The great majority of the small number of customers who use that section of route will remain within a convenient walking distance of stops where service will continue to be available. Council has approved the construction of the new Honey Gables park and ride lot, south of Earl Armstrong Road and east of River Road. Until that new park and ride lot and transit station is open in 2008 or 2009, staff are establishing a temporary park and ride lot on City-owned land on the west side of River Road, and buses will turn around at the shopping centre on the east side of River Road. Funding for the following changes was identified in the 2007 Transit Service Plan and approved as part of the City’s 2007 budget. Consultation was not required as part of the Transplan 2007 process. New two-way service during the midday and the afternoon peak period will begin in September on Route 94. Evening and weekend service will be added in future years as development in the area continues, as ridership continues to grow, and as funding becomes available. Council has approved the construction of the new Millennium park and ride lot, south of Innes Road and east of Trim Road. Until that new park and ride lot and transit station is open in 2008 or 2009, buses on Route 94 will turn around at Millennium Park. Some trips on Route 118 will be extended east to start at Place d’Orléans Station in the morning peak period and to end there in the afternoon peak period, to improve crosstown service via Heron Road and Baseline Road and to allow and encourage customers to make crosstown trips without passing through downtown. Off-peak service to and from Orléans may be added in future years. New Sunday service will begin in September on Route 136. Along with this new service, Route 135 will be changed to follow its regular Monday to Saturday route seven days a week. Saturday and Sunday service on Route 136 was removed as part of the 2004 budget reductions. Saturday service was restored in June 2006, justified by increased ridership. Service increases are being made in September 2007 on routes with high and increasing ridership, to ensure that customers on all routes are riding on buses that are not overcrowded. Funding for these increases was approved as part of the 2007 budget following the presentation to Transit Committee of the 2007 Transit Service Plan. Details of the service increases are currently being developed by staff, and will be available on octranspo.com in July. Service reductions are being made on several routes at certain times during which ridership is low to the point that the service does not meet the minimum financial performance standard. These changes were reported to Transit Committee as part of the 2007 Transit Service Plan on January 31, 2007, and will take place in June 2007. A change was proposed to Route 170, to provide service to Strandherd Station and to remove service from Jockvale Road, Wessex Road and Exeter Drive. Based on the results of the consultation process, this proposal has been withdrawn. Customers on Route 170 will be able to transfer to and from Route 95 Transitway service at Marketplace. Consultation on the proposed route changes was conducted as set out in the Transit Service and Fare Policies approved by Council in 2005. 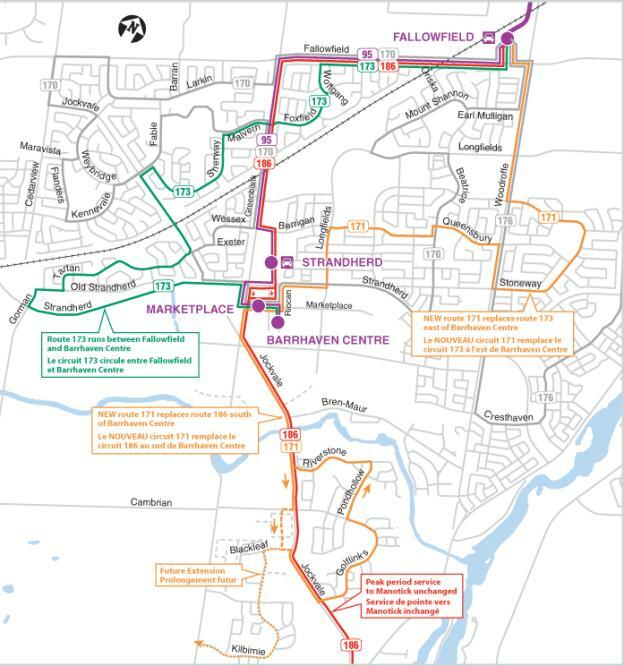 The major service change proposals for Kanata and Barrhaven, those that would cause an inconvenience for 100 or more customer-trips per day, were presented for consultation on octranspo.com and by leaflets distributed on board buses on the affected routes and, where appropriate, delivered door-to-door. A public open house was held for the service change proposals in Kanata, where staff and Councillors were able to discuss the proposals with residents and transit customers. Comments from customers were received in writing at the public open house, by mail, by e-mail, and by fax. In all, 186 comments were received from customers and residents. Of those, 71 were in support of the changes as they were presented, 74 were in opposition to the changes but have been accommodated by the changes described earlier in this report, 32 were in opposition and have not been accommodated, and nine supported the changes but suggested further changes that will be evaluated by staff for future years. The comments that opposed the changes were from customers who argued for shorter walking distances, shorter travel times, or fewer transfers. Staff have examined these concerns and have not identified ways of addressing them that would neither cause a greater inconvenience to other customers nor exceed the available funding. This report will be circulated to the Pedestrian and Transit Advisory Committee and their comments will be available at the committee meeting. Transit customers will be advised of these service changes this month on octranspo.com and in detail by leaflets distributed on board buses several weeks before the changes begin. Transit staff will assist Councillors in preparing any information to be distributed locally. Most of the service changes outlined in this memo will begin in September 2007. Some will begin later in 2007, as noted individually above. Suggestions for further service changes from transit customers, residents and employees will continue to be collected and evaluated for future years’ Transplan processes. All of the service changes will be assessed after one year of operation to check that they are meeting their objectives and that they remain the best way to provide transit service in the areas affected. Any changes which are found to be unsuccessful will be removed or revised, as appropriate. Section 7.2 of the Transportation Master Plan (TMP) sets out the actions that the City will take to expand the transit route network and to increase service levels to accommodate growth of the City and growth in transit ridership, and to encourage people to travel by transit in preference to other modes. The service changes described in this report support the TMP directions by responding to changes in travel needs and by improving service for customers by reducing travel time. There are no financial implications associated with this report, as all of the service changes will be made within the budgeted transit service levels.